Costa Rica is a hot spot for tourists that will come for a few days, enjoy the beaches, soak up all the culture they can in a week, and then trot back off to their hometowns. However, if you’re a foreigner coming to Costa Rica to stay for longer than a few days, it can be hard becoming adapted to another way of living. 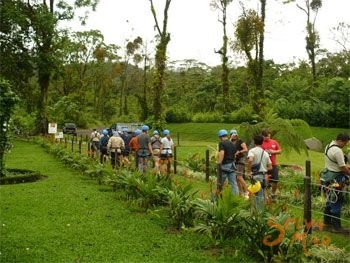 Although Costa Rica is obviously a popular tourist spot, there are a lot of things great things to do for people who are actually living in Costa Rica and want to be fully immersed as a citizen of the country instead of just being tourists on a long vacation. First things first. It’s almost impossible to live in a Spanish-speaking country and not speak Spanish. While in Costa Rica, take the opportunity to improve on one of the most beautiful languages in the world. There are traditional Spanish classes at any of the many language Schools in Costa Rica. Students can study for a few hours a day and learn the proper Spanish language. Another, less expensive way to learn is to simply make friends with Ticos. Many Costa Rican natives will be happy to teach you Spanish and will be eager to learn English, in exchange. Costa Rica is full of expatriates from the U.S. and Europe, so it will be relatively easy to make friends, when seeking the comfort of home. However, it is also a very friendly country, and many Ticos are happy to befriend foreigners. It can be difficult initially but the more activities you’re involved in, the easier it becomes. The opportunities are endless in Costa Rica. Water sports, dancing classes, and hiking are the just a few of the more common activities people participate in to keep themselves busy and in shape. Considering the weather and quantity of beaches, swimming and surfing are among the most popular physical activities in Costa Rica, although they are not the only ones. The country hosts a rich dance culture, where you can learn the tango, salsa, cumbia and everything in between. Finally, because of the country’s great natural resources, anything outdoors is definitely recommended. Try visiting one of the many parks in Costa Rica. There are also several hiking clubs that you can join and hike with a group of people and visit some of the lesser known areas of the country. Obviously you have no choice but to eat the food of Costa Rica while living in Costa Rica. But don’t stuff up on hamburgers and papas fritas, which are available in many Costa Rican restaurants. Try some of the traditional Costa Rican meals the country offers most of which can be found in sodas, which are neighborhood restaurants throughout the country, where you can eat typical Costa Rican food at very low prices. Traveling within Costa Rica and Central America can be time consuming and a bit pricey, but if your budget allows, explore the surrounding areas. Not only can you experience most of what Costa Rica has to offer, but Panama and Nicaragua are neighboring countries and only an inexpensive bus ride away.